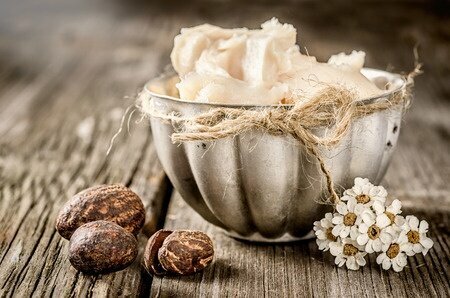 Shea butter, an off-white fat extracted from the nut of the African shea tree (botanical name : Vitellaria paradoxa, formerly known as Butyrospermum parkii) has become increasingly popular in the natural skin care and cosmetic industries. There is a very valid reason for this popularity. It is a natural product that Africans have been using for centuries for its exceptional skin healing properties. It is not only a gentle moisturizer and known to treat skin allergies, frostbites and insect bites, but also an excellent sun-blocking lotion that absorbs ultraviolet radiation. The popularity of shea butter has become a major source of income for many young girls in West Africa. So much so that shea butter is now termed as Women’s Gold in that region. The value of karite (local name for shea in the West African language of the Wolof of Senegal) nut can be gauged from the fact that felling of shea trees is banned in many parts of West Africa. The traditional method of extracting shea butter is a social activity in which women of all ages participate. The dried nut is cracked open and then crushed and ground in mortars with pestles. The crushed nuts are then roasted and ground into a smooth paste by adding water. The oil is separated by kneading. Additional water is added so that the oil content floats to the top in a curd like state. The oil curds are then squeezed to remove excess water. Whatever water remains is then removed by a process of slow boiling. The resultant creamy or golden yellow butter is then placed at cool places to harden. The modern process however involves the use of an expeller type press, which is faster. Irrespective of the method that is used there are no chemicals used up till this stage and the final product is raw, unrefined and pure shea butter. Shea butter is a cream that contains high levels of vitamin A. it also contains significant levels of vitamin E and F. This composition of shea butter lends various specific qualities to the product. Vitamin A is essential for healthy skin and eyes. It ranks as the most effective vitamin for preventing and removing wrinkles. Vitamin A in shea butter acts to improve skin conditions such as wrinkles, blemishes and dermatitis. Applied topically, the vitamin A in shea butter delivers maximum benefits of removing age-related symptoms that appear on skin. Reducing puffiness under the eyes, reducing crow’s feet and improving skin tone are some specific benefits. Vitamin E is fat soluble and an antioxidant that plays a role in many body processes. While the role of vitamin E is not extremely clear in shea butter, this antioxidant helps prevent the damage done by oxides and peroxides due to the oxidation process. Therefore, it slows the damage done by free radicals to the skin. Vitamin F is comprised of two fatty acids, linoleic acid and alpha-linoleic acid. Both of these fatty acids help in the repair and growth of human body tissues. Since the human body cannot produce essential fatty acids, these must be sourced externally from other natural products. Deficiency of vitamin F leads to dry skin that is flaky due to large amounts of dead cells. Shea butter is rich in fatty acids and therefore promotes skin hydration and skin growth. Cinnamic acid is another element of shea butter. It acts as a natural sunscreen providing herbal sun protection. This makes it ideal for people who are caught between using potentially harmful chemicals and exposing themselves to the UV rays of the sun. Moisturizers in shea butter are similar to those produced by the sebaceous glands for lubricating hair and skin. It is therefore a great natural moisturizer that is devoid of any harmful chemicals. This composition of shea butter coupled with the easy absorption property makes shea butter extremely valuable for treating skin conditions. It is also known to penetrate quickly without clogging skin pores. How is Shea Butter Different from Other Natural Oils? Basically seed oils have two properties or fractions. The first relates to moisturizing properties, the saponifiable fraction. The other is associated with healing properties or the healing fraction. Most seed oils are high in the saponifiable fraction but fall short when it comes to the healing fraction. Most of them have a healing fraction of less than 1%. While they make very good moisturizers they are unable to repair skin damage. Unlike other natural oils, shea butter has a healing fraction of 5 to 17 percent that gives it the ability to heal and repair skin damage. The healing fraction contains phytonutrients, chemical compounds that occur naturally in plants. It is no wonder then that in parts of Western Africa the shea tree is called karate tree, which means the Tree of Life. Natural unrefined shea butter has a uniform beige color. It looks like a soft and smooth creamy solid at room temperature. Unrefined shea butter readily melts when placed on the palms. Rubbing the palms helps in the rapid absorption of the butter into the skin. As a beauty product, it gives your skin that soft and smooth glow that you would want to flaunt. As a medicinal product, it can be used for minor skin injuries. Use shea butter as a daily moisturizer for face and body. Melt shea butter in your hands and apply a small quantity daily on your face before and after bath. Apply liberally on full body and wait for at least half hour before taking a bath. Do this at least twice or thrice a week. Make sure you pat yourself dry instead of rubbing the towel vigorously over your body. Every night before you go to sleep apply shea butter on hard skin surfaces such as elbows and heels. Also, apply on any rough patches on your skin. Stretch marks are normal in pregnant women. They appear when you lose or gain weight rapidly. Apply shea butter on the affected areas and see a dramatic reduction in stretch marks. Regular use of shea butter helps prevent stretch marks too. Apply shea butter on hair to give it the silky look you always wanted. Shea butter’s moisturizing properties are matchless when it comes to hair care. Pure shea butter can melt into oil form easily when rubbed in the palm. Apply liberally on hair about half an hour before shampooing it off. You can mix a little coconut or olive oil for easy dispersion. Shea butter readily absorbs in the scalp and does not clog pores, which makes it ideal for treating dandruff and dry scalp. For men, shea butter is a good option to use as an after shave in order to get relief from razor irritation or to treat minor cuts. Other than cosmetic skin benefits that are detailed above, there are other benefits of this natural product. Shea butter helps increase circulation to the skin. Delays the aging process by combating free radicals. Keeps your skin blemish free and prevents and reduces acne. Helps in treating dryness caused by eczema and psoriasis. An excellent moisturizer, shea butter can be used to treat diaper rash among infants. A superb sunscreen cream that can be used even after exposure to sun as a body lotion and conditioner. Helps to keep tough skin on hands and feet soft. Can be used as a crack cream to treat ugly cracks on heels. Provides relief from itching due to dry skin. Provides healing benefits to skin wounds and cracks. Restores sheen to hair. It’s also really great for sealing hair ends or it can be used on the entire strand for super coverage. Shea butter absorbs easily into the skin, which makes it great to use on any part of the body including scalp and tough skin. You must keep in mind that not all products being marketed as shea butter are the same. Some of the things that you need to be aware of are listed below. Purity – Many manufacturers add chemicals and other substances to make the product more marketable. It is no secret that pure unadulterated shea butter is not too great to look at. Adding ingredients, often cheap ones, is the route that many marketers take in order to make shea butter look more esthetic. However, this does compromise the unique properties of shea butter significantly. Packaging date – Shea butter loses its natural healing properties as it ages. Its moisturizing capabilities may remain intact for a much longer time but the ability to heal get compromised. This is because the cinnamic acid in shea butter that is responsible for the healing effect cannot remain stable for too long. Method of extraction – The traditional method of extracting shea butter by hand described above is the best that you can hope to get. It results in premium quality shea butter. Those that use an expeller as a mechanical aid are also as good as the shea butter extracted by hand. Shea butter extracted with the use of anything other than water should be avoided as it does not provide all the benefits that shea butter is capable of. Methods that use solvents such as hexane for refining shea butter result in the loss of the original color. Not only does the color change to a grayish yellow, the vitamin content also reduces by 95%. Raw, unrefined shea butter has a nutty aroma, which is lost once it is refined. It is obvious therefore that the dual natural benefits (moisturizing and healing) of shea butter can only be obtained from the pure and unrefined product. Lower grades are good to use if you are looking primarily for moisturizing properties. The skin is the window that shows your emotional and physical health. Glowing skin is not the prerogative of the rich or those with good genes. Modern life is full of daily stress that results in skin breakouts. Our eating habits also affect skin health leading to dullness and blemishes. Lack of adequate rest also results in puffiness and dark circles under the eyes. And there is no end to the kind of damage that results from smoking and certain strong medicines. It is essential that you take extra care of your skin in these trying times. Lotions and creams that contain chemicals may produce some miraculous short term results. The effects of these chemicals become obvious only in the long run. Rashes, dullness, skin breakouts and overall unattractive skin is what you are likely to be left with. Sometimes, one gets trapped into using these chemical products and it is almost impossible to stop using them due to the sorry state that the skin is in. Shea butter can make your skin glow. Raw, unrefined shea butter is natural and devoid of chemicals. It is a beauty product that comes with its inherent therapeutic properties of healing. It is a unique combination of emollients and fatty acids a soothing and moisturizing effect when applied to the skin and loaded with vitamins that are help in skin repair. The best option is to buy the purest form of shea butter – unrefined that has a yellow tint due to the Vitamin A it contains. Over time you are sure to understand and experience the many benefits of this natural product. I do not have a comment but a question. How can I improve the smell of shea butter without damaging its purity? Can I mix it with a little perfume? Hi Frank – do not add perfume. Get a couple of aromatic essential oils (rose, ylang ylang, sandalwood, etc) Go to a health food store and smell a few and get one or two you like and then add a few drops to melted shea butter. It should help cover the scent you don’t like.